Summary: The Marinelife Center of Juno Beach is requesting funding to equip a portion of the veterinary clinic in our sea turtle rehabilitation facility. 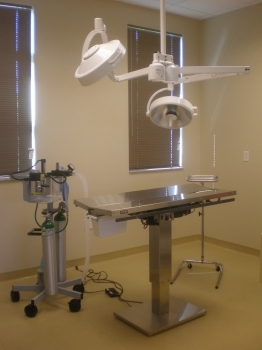 Construction was recently completed on our new building including surgery suite, x-ray room and wet/prep work area. The “turtle yard” (holding tanks) is still under construction and we expect to move all of our operations to the new center in the Spring of 2007. Our new center will allow us to increase not only the number of turtles we rehabilitate each year but it will improve the level of care for the turtles. Our current use of offsite clinics for veterinary equipment (surgery, x-rays) is not the optimal condition for sea turtle care. By establishing unlimited, onsite access to equipment we can reduce stress to patients and provide the best diagnosis and treatment possible. Results: We achieved more than we originally anticipated with these funds. Once we had the funding in hand, and were ready to purchase, we were able to negotiate with vendors which allowed us to purchase additional equipment. This did create longer lead-times for purchases as we shopped multiple vendors, requested donations in the form of discounts and negotiated prices. We also received donations of labor that freed more grant monies for equipment. In addition we were able to purchase x-ray equipment through another funding source. We now have a complete sea turtle hospital facility at our location. We have the ability to diagnose and treat our sea turtle patients on site without dependence on outside clinics or the need to transport turtles.